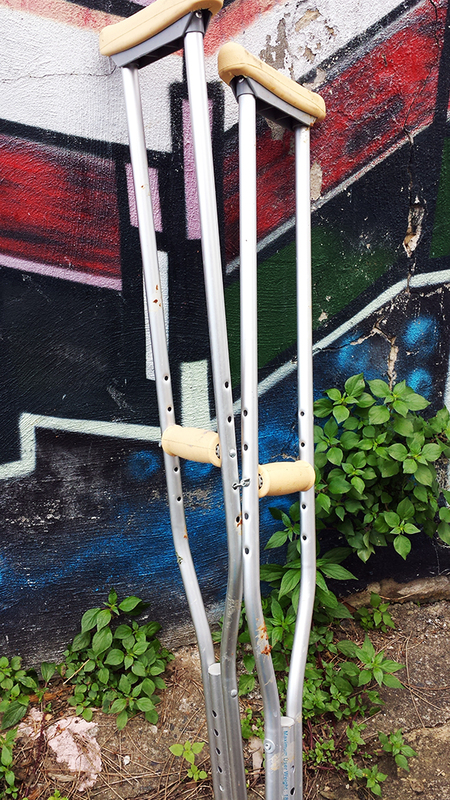 I can’t help wondering if these crutches are here because someone threw them away. No, I realise they have been discarded, left behind, abandoned. What I mean is that somebody was hobbling along, slowly making their way up the hill on their crutches when, suddenly, they heard the call to “Throw away your crutches” and they did. And lo, miraculously they could walk again. The image of the lame person being able to walk again after being commanded to do so is a powerful one. Today, it is typically used metaphorically as an exhortation to people to throw off the bad habits and mental tics that prevent them from achieving their full potential. “Throw away those things which seem to offer you some comfort but which, in reality, have kept you locked in a state of perpetual disappointment.” Crutches are seen as a barrier to self-fulfilment, not as an aid to help us heal but rather the reason why we are broken. Crutches get a bad rap. Part of this speaks to our desire to believe that anything can be achieved if we will it with sufficient fervour. The mind is stronger than the body; belief will overcome material hardship. Similarly, a failure to walk – a recalcitrant reliance on those crutches – indicates a lack of faith, an unwillingness to give oneself wholly over to the idea that walking unaided is actually possible. Only the true-believers are allowed to walk free; failure is a sign of doubt. Then there is the role of the commander, the one who issues the exhortation to walk again and is able – with the merest touch of a hand – to transform a broken, crippled body into a person made new and whole. This person has a long history, perhaps as long as mankind’s, as a miracle worker, a shaman. It is a contradictory figure: on the one hand, it is the embodiment of ego, able to control matter by means of the spoken word, the touch. Equally though, it is seen as the absence of ego, the pure conduit connecting the spirit world and the physical one. In this case, it is not the broken body which is being mended but rather the sufferer’s soul; the casting away of the crutches is simply the visible manifestation of an internal healing. The crutch then is a pivot, in many ways, on which hinges matters of belief and faith, the role of the body as a subordinate container of the soul, and our attitudes to a non-material world. The residue of this symbolism still lingers. It is possible to construct an entirely plausible scenario for this dumping – that the crutches belonged to somebody who had a foot ailment of some sort which temporarily incapacitated them requiring the use of crutches and now, having fully recovered, they have decided to throw out the crutches having no further use for them (or perhaps they were props in a play) – and yet the sight of them still resonates, more so than for many other laneway deaths.